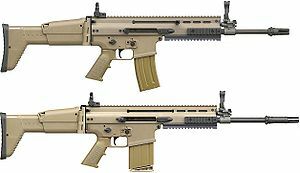 FN SCAR. Trigger creep reduced up to 95%+, rough feel is smoothed out, pull weight reduced to about 3.5 lbs. Trigger overtravel is minimized. Price runs $79. The pistol grip assembly is needed. FNAR, Winchester SXAR, pull weight reduce to about 3lbs with no percieved creep after the slight factory takeup, price is $49 only the trigger pack is needed. PS-90, pull weight reduced 1.5 to 2lbs, trigger creep reduced up to 80%, price runs $69 only the trigger pack is needed.